I'm level 80 and got an unbeatable enemy in the GW... Level 85 Commander Luke, Thrawn, Palpatine, Nihilus and Vader. 3 of them with Zeta... What kind of strange thing is this. How am I supposed to conquer with them. This is undoable for Level 80. Is that a normal behaviour of this game? A simple search on these forums will reveal, that this is a normal behaviour. Furthermore, it will reveal, that GW is designed to be challenging during mid-game, and that you shouldn't expect to finish all 12 nodes every day. That will happen for a bit...and starts to fall off again as you hit 85th. Just grind away at it when ya can, and don't be stingy with throwing a junk team to the wolves to get them to use up abilities. Lol I hear ya. For 3 days straight I have been unable to complete gw. Im barely level 82, and running an 81 phoenix team in gw. I have alot of low characters but I've learned from these boards that gw is supposed to test your entire roster, so im my own worst enemy. Tonight I barely got half way through gw when I ran into an 85 zeta finn bb8 team. My team was down 3 characters before I ever got a turn. It's so frustrating so my only consolation is knowing one day I'll be able to sim it. You are not alone my friend. I have the same problem lately, and I increasingly encounter these impossible-to-beat, 7* teams 8-10 levels above my own on node 2. I don't think that's not supposed to happen. According to developer comments on Reddit, the first nodes are meant to be relatively easy. For example, tonight I was up against a 7* level 77 nightsister team. I'm lvl 69. My teams are around lvl 64. I had a look at their Daka and saw 2 golden health mods and 4 purple and blue speed mods. I don't have access to this kind of gear yet. That's not a challenge, that's plain impossible. I wouldn't complain if I were met with a team like this on the last 2 nodes or even mid-GW, but on node 2 this means zero GW tokens for the day and no chance to level essential characters like Zeb. The daily GW run used to be my favorite part of the game and I read everything I could find about strategies. I know not to whale out my top 5 characters, maintain several similarly strong teams, preload them on easy nodes, retreat and retry etc. Maybe I spent too much money and this is meant to encourage me to spend even more Or the algorithm that finds a matching team for me is a bit off. Whatever it is, this puts an end to my farming plans and takes a great deal of enjoyment out of the game. I understand that I won't be able to complete GW or even get to the final nodes every night, but to face such an overpowered team so early on really strikes me as a bug. I am level 79, so at a similar place in the game. At this point you should have at least 2 top squads. In my case I have a Phoenix squad and an Empire Squad. Phoenix are super resilient and can win most encounters where they aren't immediately zerged down. My empire squad has huge front loaded debuffs and damage but can't really sustain. What I do is use Phoenix for 95% of galactic war, killing 3 people and then auto-basic attacking the last 2 down to reset cooldowns for the next fight. I make sure to use my empire squad in the first 3 battles against a super weak opponent where I can finish it with just basic attacks, but the next time I use the empire squad most will have significant turn meter. I continue doing galactic war, trying to use just phoenix squad even against tough opponents so I can save the empire for when I come against a squad that I will never ever beat with just phoenix, like the one you encountered. For that squad I load up 5 random **** characters and have them fight first. They should soak up fracture, lightsaber toss, cooldown reduction etc. Then I send in my empire squad and focus on killing at least 1 character. I would probably choose Palpatine and then CLS. Killing even 1 person makes the fight 10x easier for when I bring in my Phoenix squad. Everyone will be getting their killer cooldowns back at different times so my resilient squad will likely survive and pick them off one at a time. Not a guaranteed strategy but will win against surprisingly powerful opponents. OK, one piece of advise. Farm mods like mad. An arrow that is not speed - SELL. Anything not an arrow without a speed secondary visible on drop - SELL. Use the gold to level your key toons and develop the best mods (since you have been farming speed, focus on gold speed mods only at first). I know they said speed is not everything now, do not listen to that. GW hates me tonight. Currently I am 82, with a decent phoenix team and somewhat of a decent jedi team, and that's it. The jedi team shares ezra and kanan so it's not even complete stand alone team. But im 82 and I've been stumped on the last node and even like the 6th or 9th, but tonight? Lol Node #1 lol. So what exactly stops you from having decent mods? There isn't any specific characters req to farm speed mods anymore. You used to have a full resistance team. And even then, health mods with decent speed secondaries will do well at your level. You can also buy mods from the shipments and level them. You can get gold ones. If you choose no to it's on you. Also, your top characters shown in your screenshot have absolutely no synergy with eachother and it is no wonder you aren't winning when faced with a challenging team. For example, if you farmed Pheonix to 5 stars, which is doable by your level. You could have a 5 star thrawn and ep. With ep lead, thrawn, vader, tarkin, and a decent tank like stormtrooper or another attacker like tfp, the team you faced is beatable. I'm not trying to sound mean but the issue you're having is from not building teams with synergy, not from the game being broken. does your jedi team include a decent bastilla? Bastilla lead is a hard counter to this team unless they have crazy potency mods, which at that level I highly doubt. Running bastilla lead should be able to easily handle this team only 3 levels higher. So what exactly stops you from having decent mods? What stopped me at level 69 were the hard-hitting, one-shotting enemies in stage 8 of the mod battles. I still haven't managed to get past the level 76 Kylo on node 6, so the speed mod challenge is still locked for me. And once I unlock it, I'm a still long way from finishing tier III with 3 stars in order to farm speed mods that are worth upgrading. Now go ahead and tell me that you breezed through all that in your 60s because some players are simply that superior. Then I'll know for a fact what I'm already suspecting. You may not be trying to sound mean, but you certainly do your best to sound condescending. I already noticed that in another thread. You might want to check your attitude because you come across as rather rude and patronizing. Not to mention presumptuous since you have absolutely no idea what I or other players are working with. Sorry for the tone, but I'm merely replying in kind. It's one thing to barge into a thread about an issue that doesn't affect you but many other players with "Well, *I* don't have this problem, so there". That's merely irrelevant noise to those of us who are affected by it. But alleging that we have no clue what we're doing adds insult to injury. I have little patience for people who insist the game is broken when it's not. Constructive criticism is that your team needs work. I am willing to iffer advice to players that want to improve but you first have to focus on what you can do to improve rather than blaming the game design. And no I didn't breeze through everything in early game. In fact, I spent a lot of time running toons like clone wars chewie a d jedi councillor in gw. That's how I know they aren't good. Speed mods aren't necessary. You can use health mods with decent speed secondaries and be competitive. Also, I'm 90% sure you can borrow an ally for mod battles. There are plenty of people that share their ally code that have g12 trayas or other really good characters. That can go a long way to beating mod battles as well as cantina battles, and hard node battles. I can't say if it's enough at your level because I didn't know about it at your level but it can't hurt to get powerful allies to borrow. That screenshot only shows characters you marked as favourites. If you want to document what your top characters are, you should sort by 'power' and not by 'all' — or simply list the GP of your 5 highest GP characters. Opponents are based on the GP of your 5 highest GP toons. I have given up on winning GW daily. I am now just waiting for the "magical" day when I get 150 wins and level 85 so I can sim. I used to get so frustrated, but now I just don't let it get to me. I have my goals, and not doing more teams is one of them. Not everyone agrees with my goals, but they're mine and how I want to go ahead. I got my phoenix to gear 7, 5* and now working on a half decent scoundrel team. Next I want to work on 2 empire toons (so that once I have EP, Vader and Thrawn, I'll have an empire squad to help in GW and to use that in Arena). Once i have those two toons to 5* and gear 7, I'll move back to Phoenix and take them all the way to 7* and gear 8/9 (not sure if that's enough for Thrawn, but I'm only L65, so doubt I can do 7* thrawn now anyway). Only once I have Thrawn, EP, Vader, R2D2, will I work on Jedi to get my Yoda and then squad for CLS and then Resistance, whom I heard is great for completing GW. If that only happens once I get to L85, so be it. Can't sim until L85 anyway. But when you look in the GW store, there aren't that many fantastic toons. I wanted Zeb to 7* (to join raids, etc) and I did that. I'm now doing Biggs and then I'll do a few others. But it's not the end of the world. Arena gives way better characters imo. You're on the right track. And don't worry, you'll eventually get the simming. Even if you focus on one team, it eventually gets easy enough to auto. Then you start wishing for the sim just to save time. My first team that could almost finish was Phoenix with cls subbed in for chopper. Works well since everyone can regain protection and cls adds some punch. I also had a good empire team for clean up by that point. But as you can tell that was with a hero's journey character so it was well after hitting lvl 85 . Mods are the biggest thing. Speed in particular. Opponents in gw usually are super slow so if your team is fast you can almost always beat better geared/zetaed opponents. As others have said though, it does get better very quickly once you hit a certain point. It should be well before you hit the 150 mark and can sim it. I started just under a year ago and I made this exact same post, frustrated at way overpowered and higher level teams I was facing. I got the same responses about it gett8ng easier. I found it hard to believe and then a couple weeks later I was autoing everything. Pretty much everyone has been in the same boat. yes usually it’s like before I’m about to gain a lvl which is like once a week or however long it’s taking me I don’t specifically keep track on lvl 83 now just lvl up and they hit me with 88k NS zeta on talzin and 2 others they hit me with g13 lvl 85 jedis with zeta on jolee at lvl 79. I beat NS with some strategy don’t think I have lost since lvl 79 or maybe once since but climb higher in ur arena u need to start collecting speed mod they will be necessary for overpowered teams they throw at u with good team and strategy u will have a chance. Needed to switch arena mods on boba fett for example to beat NS speed will be the key when over powered. This like the thread I started and a lot of people, comes from the fact that people give the notion that with proper strategy and planning you can almost always beat it. This is false. Yes there is strategy. Yes you can reserve teams, prep energy, etc, but will this ensure usual success? No. RNG will screw you on a fairly consistant basis. I run into the unbeatable team between 2 and 4 times a week. Sometimes its on node 12, sometimes on node 2. There will be vet players who will make it sound like if your clever you can bypass this. Just put your head down and keep grinding. After capped with multiple teams you'll be consistantly succesful. Focusing on 1 team early on isn't whats hurting you. You'll be matched up against teams that would stomp you even if you have 5 teams all of equal strength to your best 5. My strategy is not to reserve a team I use arena straight through my strategy was understanding zeta on talzin they changed NS abilities. I never read it or cared because only like one NS team in arena. They kept reviving 3 times until her zeta kicked in and I was ability blocking both talzin and daka. Someone said read zombie unique and it was the culprit. My strategy was to put arena mods on boba fett to increase speed and use him to execute each one by one so they can’t revive had to start with the one that gains offense because when I left her as last she would defeat me with one hit. Took a few tries but I had a team that could get the job done and the necessary tools to assist (mods) without both and strategy and understanding would have quit after first 5 tries that failed. Some times I use back up team rebels when squad is weak I would waste abilities like stun to prevent damage but that’s the only backup I use only my arena can beat **** lineups they throw at u to prevent u getting ur rewards/ “test ur knowledge and understanding of game” actually forgot boba prevents revives because it’s been that long since I have seen NS in arena think I was in mid 70s last time lvl 83 now. Something happened to Galactic War recently with one of the updates. My son and I built our Rosters around Galactic War from about level 55 on. We didn't have a top 5 Arena squad and everyone else. We had 20ish guys within about 15-20% power of each other. Top Range was 7000, bottom range was 6000. Never had a problem getting at least to battle 9. That was before Bastila. After Bastila we never had a problem completing the GW. We were both at 150 completions before level 80. We never encountered this happening before a few weeks ago. Then a few weeks ago my son with his guys in the now 8000-9000 range ran into a nightsister squad with 14000ish power each(72000 total, his top 5 were 44000). His Jedi with Bastila got obliterated. His Empire with Palpatine got obliterated. He was unable to complete. He was level 82 or 83 at the time. Now I was under the impression that GW is based off some number of your top 5 or arena squad or whatever and the various nodes use some percentage of that top 5 with earlier battles having lower percentages up to the last battle having 15% more. You might chalk this up to getting higher in levels but my other son who had a mid 40 account at the time with guys in the 2-3000 range ran into a team with 6-7000 power on battle 8. Not tough battle 9, 11, or 12. That was a restart. My wife who is mid 70s ran into a 65000 power team(her top 5 is around 30000). Also a restart. 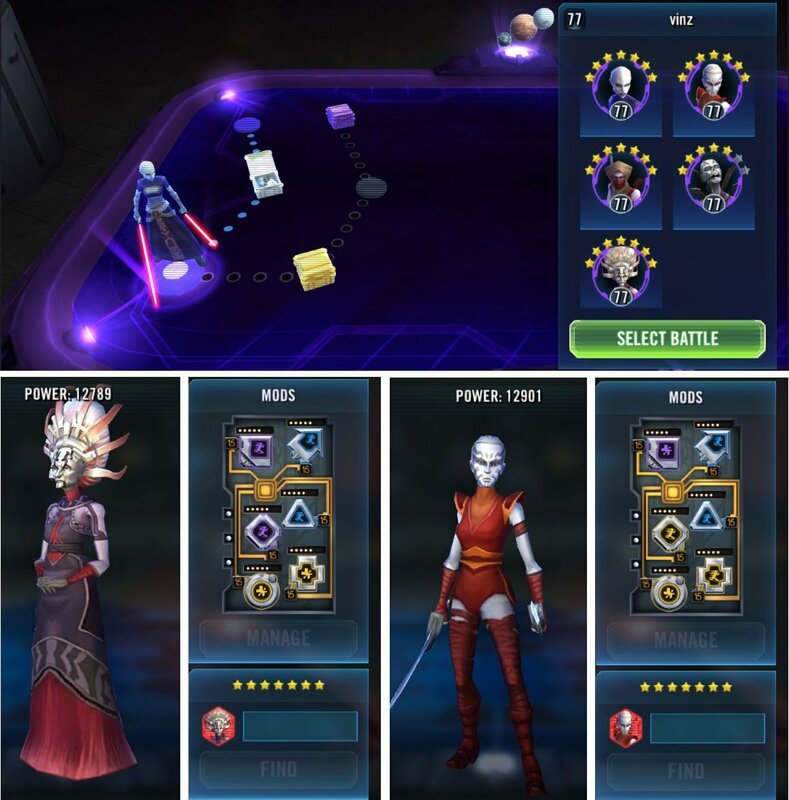 It happened to me about a week or two ago where I used my Empire team first, BH second, and on the third node was going to use my Jedi but ran into a 70000 power Empire team(with Thrawn). My top 5 was 47000. Had some bad luck on stuns and couldn't retreat out because of how quick the empire can gain turn meter. My BH managed to come in and take out Thrawn and Tarkin, then my Empire came in to finish them off. Fashioned a sustainable team to work thru the next few nodes before running into a 70000 power Bastila team with Yoda on battle 9. Empire, with turn meter advantage managed to take them out and I went on to complete the war. Since then I have seen teams with 50-75% more power than my top 5 on various weird nodes(2, 5, 10). Sometimes I get a proper GW(nodes using teams based on the now 50000 power of my top 5) but I'll still notice a few oddly placed teams with way too much power for the node they are on and relating to my top 5 power level. New rule: Bastila goes first. My jedi team is bastila lead, level 80 and gear 9, fully modded. But gets destroyed by this team.